MORE METAL CODICES ETC. : Seal of Solomon may have been found in Amasya (AMASYA – Anadolu Agency/Hurrieyet Daily News). This is an intriguing little collection of goodies. The photo is from the article. Click on any of the following photos for a larger image. There are several points to note. First, the ring-bound metal book in the left foreground looks very much like one of those Jordanian lead codices. Second, some gold codices with Jewish imagery are already known. Some are in the possession of a dealer in Karak, Jordan. The gold books in the photo look to be about the same size. (My scale is the tiny codex between the seal stamp and the calf. It is reported to be about two centimeters long.) None of the photos are clear enough for me to identify the image. For the Karak books, see Samuel Zinner's online report on the Jordan codices, Son of the Star: Bar Kokhba and the Jordanian lead books, pp. 754, 987-992, 997, 1098, plus, in general, chapter 9 and Appendix III. Third, the "seal of Solomon" looks like a medieval or modern artifact to me. There is a Talmudic legend about a ring that Solomon used to control demons, but I am not aware of any objects like this one from antiquity. Fourth, the golden calf has obvious resonances with the biblical golden calf, but this one has a menorah stamped on it. What on earth does that mean? The only comparable object I know of is a bronze and silver bull statue excavated at Ashkelon. It dates to the first half of the second millennium BCE and it is about the same size as the gold one in the photo. I don't think there is any direct connection. That was as far as I got yesterday. Today, a couple of new articles have new information. The Daily Sabah: Artifacts hoped to include Seal of Solomon date back to Middle Ages, experts say. 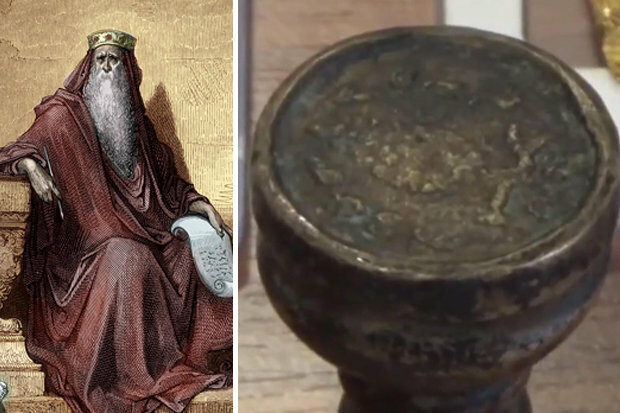 The examination by experts on the historical artifacts seized in an operation on Tuesday in central Turkey concluded that they date back to the Middle Ages, wrecking hopes that the legendary seal of the ancient Israelite King Solomon, who is regarded as a prophet in both Judaism and Islam, may have been found. I don't think hopes should have been very high in the first place, but let that go. The Daily Sabah article also has a photo. This gives a better view of two of the gold books. The one in the left corner has an image of a bearded man, with some Paleo-Hebrew on the right side and a menorah in the bottom right corner. It is identical to an image on a lead codex also in the hands of that dealer in Karak. (See Zinner, "Son of the Star," p. 1119). The codex to its right bears an image of what looks like a wasp or a bee. I know of no parallels to it. I cannot make out the images on the fronts of the two other gold codices. In the lower right there is also a (lead?) object that looks like an envelope with a menorah stamped on it. The article itself has no merit. If you decide to read it, be forewarned that some of the headlines and photos on the same page are likely to offend many readers. The article does have a (poor) image of the front of the seal. I can't make out what is embossed on the front. I need a clearer photo. So I can't tell if it shares design motifs with any of the codices. But I include it for the sake of completeness. I see no evidence that it is a seal particularly associated with Solomon, and none of the articles offer any evidence for the assertion. I don't know whether it is correct or not. Where does that leave us? 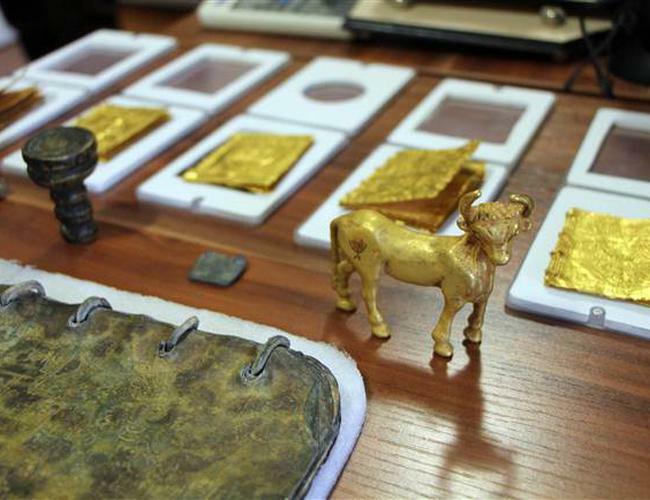 In recent years the Turkish authorities have diligently seized many supposed artifacts from smugglers. But I cannot recall any of them being convincingly ancient. I would not say that they are necessarily all forgeries, but rather that the Turkish authorities and media sometimes assumed they were ancient before they had been fully evaluated. See past stories here, here, here, here, here, here, here, here, here, here, here, here, here, and here. The last two links do refer to a "gold-plated ancient Torah," which conceivably could involve a discovery like the latest one. This latest group of seized objects has clear connections with some of the Jordanian metal codices, particularly a group know from Karak and Shobak in Jordan. Dr. Zinner seems inclined to think this group originated in the Middle Ages, the Renaissance, or even later (see his report, p. 1041). I see nothing in the current group to indicate a different conclusion. Nor do I see anything that points to them being ancient. For my four-part review of Dr. Zinner's report on the Jordanian codices, start here. Follow the relevant links for previous posts on the codices, going back to the first announcement about them in March of 2011. Cross-file under Fake Metal Codices Watch. I acknowledge that various elements of the current discussion may point to some of the Jordanian codices being something other than fake, although nothing I have seen adds up to a persuasive case. In particular, I have reviewed the evidence carefully and I am unconvinced that they are ancient artifacts. In any case, I continue to include this cross-file rubric so that readers can search it to find all my posts on the subject. UPDATE (9 October): My Facebook friends David Meadows and Roy Kotansky have pointed out that the bee design is based on the ancient (pre-Christian-era) Ephesus Bee coin motif. There is discussion with examples here. Regular readers will recognize a pattern we have already seen with the other metal codices. Someone with access to some ancient coins, and apparently not much else, used the coin images and inscriptions in a poor effort to construct objects that looked like ancient artifacts. All the indications from text and iconography point to the fabricator operating relatively recently. Notice that here, as before, we have ancient Jewish motifs mixed with a pagan motif. That's not unprecedented for antiquity, but the pervasive use of an eclectic mixture of coins as source material points to someone who was working with little information from antiquity and therefore from a more recent period. That looks right to me. Here is the coin, with the images reversed and rotated 90 degrees, so that they correspond to the alignment of the negative image on the seal. The bottom image on the coin looks to be the same as the image on the seal. So this "Seal of Solomon" has nothing to do with Solomon. 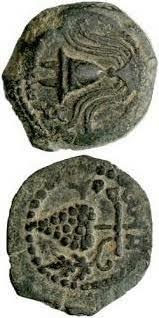 The image is taken from a Herodian coin. 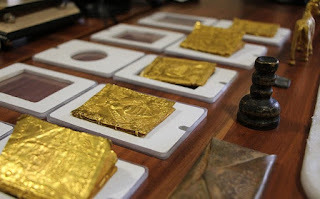 Once again, the person(s) who manufactured these codices had an eclectic collection of ancient coins, but little else, and they did the best they could to make ancient-looking objects using the images and inscriptions from the coins as templates. Hebrew Bible job at St. Andrews!